The Daily Nebraskan did a great piece on UNL’s Out of the Darkness Campus Walk featuring myself as the executive team’s Advertising & PR Chair. Through walking for suicide prevention on campus, we show that hope walks here in Nebraska. Katy Bagniewski has been walking to raise money and awareness for suicide prevention for seven years, but the impact the Out of the Darkness Walk has had on her will last far longer than through this year. 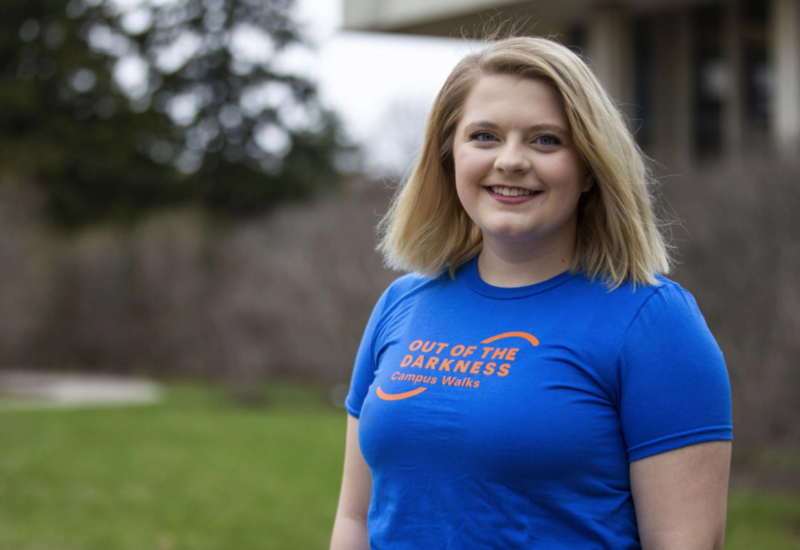 The University of Nebraska-Lincoln 2019 Out of the Darkness Walk will take place Sunday, April 7, from 1 p.m. to 4 p.m.
Bagniewski, a senior agricultural and environmental sciences communications major, said the walk, which the American Foundation for Suicide Prevention hosts, is where her family sought comfort and community after her uncle died by suicide in 2011. She said UNL’s event is a campus walk and tends to specifically target students to spread the word about mental health and the options available on campus to help. Because the event could lead students to remember negative experiences, senior journalism major Noelle Ervin said the University Health Center and Counseling and Psychological Services will have a booth with a counselor at the event. Ervin first attended the walk her freshman year and said she felt like an outsider. She said her hometown did not teach her about mental health, and those with mental illnesses were disparaged. However, when she looked inward, she began to understand it’s OK to have mental health disorders. When the annual walk happened the next year, she felt the community of those with mental disorders again. She said she had been feeling alone in her struggle with mental health, but the walk reminded her there are a lot of people helping and supporting those in need. Bagniewski said this community is important to her as well. She said her aunt, her uncle, a close friend and a classmate all died by suicide. Within five years, she watched her dad bury two of his siblings and her grandparents bury two of their children. She said her story is not uncommon. “I tell my story because sharing my story might help others who are going through similar things,” she said. The theme this year is “Hope Walks Here,” and Bagniewski said the group has focused on hope in Nebraska. Even through grieving, there is still hope and help, she said. Bagniewski said sharing stories to eliminate the stigma and to raise money to support suicide prevention, research and advocacy helps spread this hope. She said her experiences have shaped her view on mental health. “[The walks have] lit a fire in me to fight the good fight for mental health,” she said.